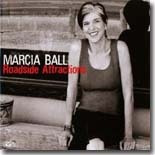 Marcia Ball is one of our all-favorites among Blues Bytes reviewers, so it's not surprising that her new CD, Roadside Attractions, is this month's Pick Hit. Chicago blues veteran James Kinds may not yet be a household name among blues fans, but his new Delmark disc, Love You From The Top, moves him closer to blues fame. It's this month's Surprise feature CD. This month's Flashback looks back at the excellent late 1970s album, Rockin' the Juke Joint Down, from The Jelly Roll Kings. Our What's New section features new releases from Gregg Allman, Roomful of Blues, Dana Fuchs, Johnny Rawls, Los Fabulocos, Nellie "Tiger" Travis, Rory Block, Damon Fowler, Darren Watson, Steve Dawson, and more. All contents Copyright © 2011, Blue Night Productions. All rights reserved.